"She […] works with willing hands"
My neighbor, Miss H, announced this resolution in the middle of a soap-making workshop. I laughed and thanked her. I almost asked what a sweet voice and Bethlehem have to do with another, but I was distracted by the potion of lye and goat’s-milk in front of me. Besides, I’ve learned to let the wisdom of my neighbors percolate for a while before offering comment or question. Most of them are my elders by several decades, and all have endured more life–both joyful and painful–than I can imagine. So I try to listen well before speaking my mind. This was in the spring time, approaching Easter, and I was finally beginning to feel my roots break through this clay-thick, east-Austin soil. It was (and remains) a painful rooting: I have lamented my quiet academic life with tears and terrors; I have missed my students and Chickasaw neighbors fiercely; and, despite coming here to live in community I have been so lonely in this frantic city, a beautiful Babylon where everyone is friendly, but it is hard to make a friend. And yet, for all that, I could feel the roots growing, ancient instincts inching toward water. And so, in my weariness and hope, I received Miss H’s nickname as a benediction: Bethlehem, town of Christ’s birth. Let it be so for me, I prayed, Let Christ be born in me. A few weeks later, on the Thursday before Easter, I learned I was pregnant. I think babies must always be a kind of joyful terror, not to mention an interruption in practical affairs (e.g. My first thought was, “We live in an RV — which cupboard is big enough to hold the baby?”), but we had wanted a child, prayed for this child, and so we were glad in our trembling. On Easter Sunday we had a dessert potluck for friends and neighbors. Afterward, I went for a walk, noting all the blossoms on the fruit trees (our farmers have planted over 100 on the property), laughing to think of all the peaches, mulberries, persimmons, and satsumas the year would bring. Perhaps this is why God has called me to die to so much, I thought: to my career, my students, my parents’ hopes. Perhaps it was so something new could be born in me, in us. But the day after Easter I began to shiver, and by Tuesday I was delirious with fever, a virulent strain of flu. On Thursday, I began bleeding, and that was the end of it. To feel, however briefly, so full of life, and then to crash back into the reality of death was agonizing. For most of the past nine months, I haven’t thought directly about the loss of the baby. 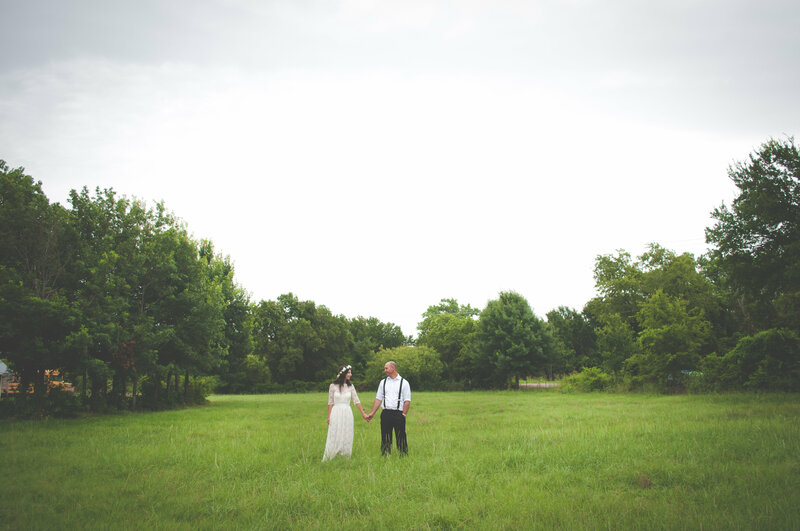 It was so early–mercifully early–that we had no time to make plans or set expectations in any particular way. We had picked no names, planned no showers, imagined no futures. And yet, the grief has infected almost everything. Feeling betrayed by the future, I have longed for the past more than ever, resenting the work at hand, resenting my husband, who thrives on dreams and future plans. But the baby would have come right about now, sometime during Advent. I usually observe this watchful season with a careful and quiet gladness: lighting candles each morning, decorating the house little by little, sending letters and gifts to friends. I’ve done none of that this year. But I have pondered what it means to long for a savior, to cry out a God for deliverance, to demand, like Martha, why my Lord has not come sooner to raise the dead. I have remembered Simeon’s words to Mary, that a sword would pierce her heart. I’ve remembered Rachel weeping for her children, for they are no more. I’ve recalled the Magi, bringing incense for burial to a fresh-faced child. As I walked tonight I had a strange fancy that one day, when we come to table in God’s kingdom, we’ll feast on all the food we thought was lost — bread from wheat we saw scorched in the field, fruit from the tree that fell in the frost. And the little ones gathered at the table? Only God knows. We can believe, if He will help our unbelief. Heavenly Father, if there is a life here for my books and quiet ways, if there is water for my roots, then send your Son to pitch his tent (or trailer!) right here among us. Put honey on my tongue and make room in my heart: let me be Bethlehem, even if there is no baby in my arms. Our RV moved to its permanent home! Now that the pad sites and utilities are connected in the RV “neighborhood” of the Village, we’ve taken our place here in a little bend in the road. Cedar-green and sunlight streaming through my windows. In small ways, we’re celebrating Advent and pondering what it means to wait and hope, watch and keep the faith. Left, tea lights in colored holders form my #rvliving version of an Advent wreath. Right, a few hundred stitches I offered to Church of the Cross, the new Anglican church plant my husband and I attend. More residents move onto the Village each week, and guests come from around the world. This week my friend Hiram and I taught soap-making with a group of Fulbright scholars from South Korea, China, and Romania. Garlic (and strawberries and chamomile and radishes and ALL THE GREENS) flourish in the garden. Goodness grows all winter here. And finally, decking the halls is serious business around here. Have you ever seen so many men help decorate a tree? The grand tree lighting will be tomorrow — a celebration for residents, staff, volunteers, and friends of the Village. That’s the dispatch from our home — what about yours? What are your emblems and images of these watchful winter days? Connections interest me. As I watch builders secure the roof onto a new porch, I wonder what holds the tiny house together. Nails, joints, staples, glue, and gravity? Later in the morning, I see a formerly homeless man teaching a business executive how to harvest ripe figs, and I ask the same question: what makes them together instead of apart in this moment? The third component of imagination (which I also reflected upon in my last entry) in my recent seminar is that imagination is the power that connects, drawing disparate images, ideas, and feelings into integral wholes. As the power that mediates what we see and sense, the imagination is a kind of collector, amassing in our minds a wealth of images, ideas, memories, and visions. A weak or immature imagination organizes this array arbitrarily or fancifully, jumbling (for example) our anxieties about tomorrow’s presentation with the smell of coffee, as the wildest of our dreams might do. A disciplined imagination, on the other hand, selects and integrates what it receives according to principles: moral, aesthetic, theological, and so on. Thus, a historian with a well-trained imagination can collate thousands of primary documents and recorded facts, and yet can, in a lecture or a page, give his readers or students a coherent picture of a day in the life of the past. As I have pondered the imagination’s connective power, I’ve sought for a good metaphor. In this search, I’ve realized there are a number of ways in which two material things can be connected. Most simply, I can mix things together, placing them in proximity to one another but little else, as with a tossed salad. A mixture can be good or ill, according to the principle behind the mixture (e.g. the “lettuce s’mores” I tried to make as a child were a work of botched imagination). Mixtures do not necessarily require much planning or foresight, making them easy to create spontaneously and without much effort. At the same time, these mixes have very little lasting integrity, and will put up little resistance if some force attempts to separate them. Another category of connections involves taking two (usually similar) things and using both to create a new structure. A knot–in which two threads are looped and pulled in such a way that the resulting structure holds them together–is an easy example. Similar is the interlocking warp-and-weft structure of woven fabric, or the puzzle-piece precision of dovetailed joints. Depending upon the materials and the skill of the maker, these bonds can be both strong and flexible. At other times, a third element is introduced to bind two things together: thread to stitch together two patches of fabric, glue to bond two pieces of paper, a nail to secure one piece of wood to another. In these cases, the integrity of the bond depends chiefly on the strength and skillful application of the third thing, the connective element or substance. Finally, things can be combined by melding or melting them together. When I make lotion, I melt beeswax into jojoba oil, for example. Once melted, I can no longer tell with the naked eye where one constituent begins and the other ends. Dissolving one thing into another, or steeping, as I do with tea leaves and water, produces similarly powerful combinations. My instinct is that each of these processes can serve as metaphors for the various ways imagination can connect the elements of our interior world, as well as connecting us to the world around us and to one another. Imagination can, with dream-like generosity, mix the images and feelings of our day into jumbles of delight or terror. A skillful imagination can weave two things (for example, prayer and cooking) into a strong, flexible union by identifying natural structures for connection (the tedious work of chopping vegetables, for example, can provide the mental freedom necessary for prayer). Imagination can introduce a third thing–a common language or memory, for example–to bind to people together. And perhaps, imagination can create the necessary conditions for two things to meld with one another, no longer simply joined, but participant one with the other. Before I venture more on that mystery, perhaps I should go spend some time with our community blacksmith. For me, how to discipline and empower my imagination, making it an agent of powerful integration, is a live and tender question. As I walk through the early months of marriage, longing for the mystery of “two-become-one,” we are making our home in a village for the chronically homeless, one that aims to restore their sense of connection by empowering the people of this city to come, know, and love them. Both these works–marriage and ministry–have every chance of failing, for we live in a fallen world. But with each thread I weave and each hammer I hear, I pray for the grace to do this hard and needful work: mix, weave, knit, stir, dovetail, glue, meld, and cleave. My husband’s love language is dreaming. The eyes of his heart are roaming and keen, restless until the day they find peace in the sight of God’s kingdom. But so long as that new heaven and new earth remain hidden, his eyes wander, gathering hope in the most unlikely of places, including his wife’s timid and fretful spirit. The broken ground of this new life means that my own ability to dream–once such an enormous part of my life–has been shaken out of sleep. This awakening has been both hard and sweet: hard because I have realized that most of my dreams over the past decade have been for myself. I have imagined any number of happy scenarios for my own future, but I have not dreamed much for the sake of others. This has been a failure of imagination, a failure of love, and I have repented of it. With that confession, though — such sweet relief. Dreams that once seemed too grand for “real life” suddenly glimmer with real possibility. And why? Because my private hopes no longer need to be enough. The little garment of my ambitions are not enough to keep anyone else warm, but just imagine how much more they can do if I see my dreams as one strand that I weave into something much larger. Alongside this man I’ve married, I am learning to dream not only for myself or our household, but for and with others. This task–learning to dream for others–is one of the great and difficult works I’m undertaking in wisdom’s workshop. How can I dream with and for you in this season? If you will, use the “connect” tab and let me know on Facebook, Instagram, Twitter, or an old-fashioned letter. Finally, if you’re in the Austin, Texas area and would like to continue this conversation face to face, I’m leading a seminar entitled “Crying for a Vision: Reclaiming Imagination for the Common Good.” It will be a four-week series, beginning Tuesday, September 15 at 7 PM. Sponsored by The Austin Institute for the Study of Family and Culture, we will meet at 1611 West Ave. Austin 78701. I would be honored and delighted to see some of you there. According to the calendar, you were my briefest home. Three years, June to June. When people asked, “Will you stay,” I made no vows, but I planted orange trees. I made no promises, but I set my table and said, “Come, rest” to the ones I loved. Trace the sun’s course across my heart, and see that my time with you was deep, though it was not long: you were the first place I thought I would stay for good. For good. I could have stayed for the good of my students, generation after generation of kids from small churches, surprising poets and powerful singers, men and women with gentle spirits and strong loves. I could have stayed for the good my friends, my dear and laughing people, wise parents and clear-eyed neighbors. I could have stayed for the good of my parents, who are tired, and deserve the haven they would have had in that azalea city, on that backward and beautiful little street. In the story of my life, I do not yet know what to call you: were you my rightful rest after noble labor? were you another future God would have honored? Or were you my isle of the lotos-eaters, my surprising testing ground? How many rain showers did I enjoy and endure along your temperate coast? Perhaps that’s why I cried so much on the long road from there to here: a tear for each summer shower, each February deluge, each late-spring wash, each autumn tempest. Oh, Alabama, beloved, I will miss your men in seersucker suits, your deep-south drawls, your thundering Baptist preachers and grand archbishops. I will miss walking to church on Sunday mornings, hearing the Methodist bells play hymns each afternoon. I will miss a city of ancient trees and old money, where the talk after Christmas turns to society balls and parades. I will miss a city where some new flower — shocking winter camellias, shy violets and snowdrops, brief-but-bold azaleas and wisteria, honeysuckle and magnolias — blooms with each new moon. I will miss little girls from down the street knocking on my kitchen door, hands full of gardenia blossoms they picked just for me. I will miss little boys and old men stopping me to say, “That’s a good clean hound you got there.” I will miss neighbors who presume and interfere and protect. I will miss your bayous and bays, your legends of pirate treasure and your sad history of slaver ships. I will miss a history so dark and bright that it cannot be summarized, reconciled, explained away. Perhaps most of all, I will miss feeling myself at the end of all roads. I will mourn the peace of tracing highways, streets, and footpaths to the sea, where the tide washes them away with all other pretensions. Neither my road nor my history ended with you, despite my Satsuma trees, despite those long and hopeful suppers. Joy has carried me away, but I will miss you, my sweet home. As 2015 begins, I am making my home with two broken saints. The first was a housewarming gift from my mother. Buying Beth-Haven was one of the loveliest hours during a long season of triumph: completed PhD, wonderful job, and now, a perfect little cottage to call home. 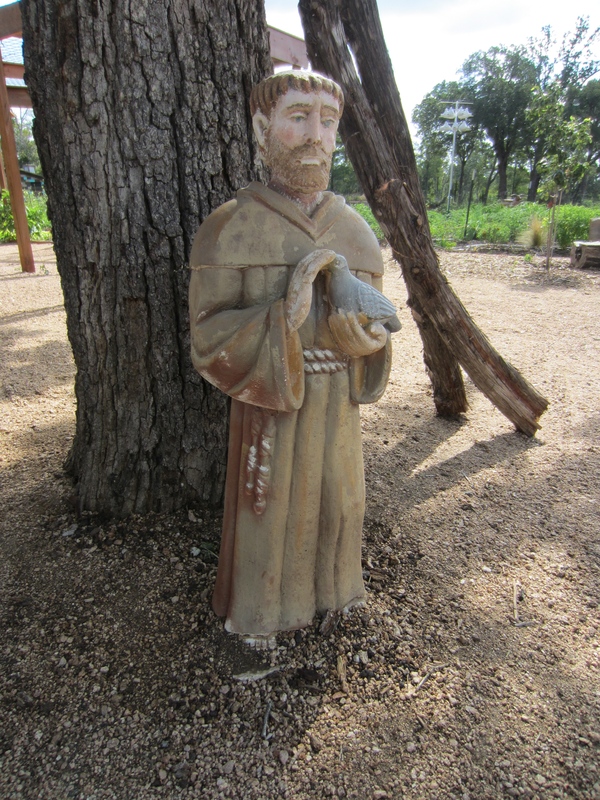 St. Francis was to serve as a token of welcome, a sign of hope for all creatures great and small who might come to share the house with me. Unfortunately, when we opened the box we found him broken. I had neither the skill nor materials to mend him, but I could not bear to toss him into the trash. It hurt to look at him, knowing that my mother had wanted to give a perfect gift, and realizing that we had no way to repair him. Broken Francis stood between us, embodying the fractures in every human relationship, even the most loving. What do we do with such signs of pain? Cast them away? Order a newer model? At first, the best I could do was to station Francis at the front door. He wasn’t pretty enough to set upon the mantle, but he seemed content in his humble place. Sometimes this is the best we can do with painful relationships: sometimes it takes all our strength to keep them in the house, to look at their broken faces each day, to acknowledge that we are still at home together. A few weeks later, some of my friends’ children taught me an even better way. While the grown-ups talked, they went foraging for azalea blossoms, which cover south Alabama in the springtime. After everyone had gone home I found that they had found my broken saint. Rather than fear or pity him, they played with St. Frank, filling his hands with flowers. My timid fidelity has resigned Francis to a dusty corner, but they had more courage: if they could not mend what was broken, they could find other ways to make him beautiful. And so my first broken saint became, after all, a sign of hope, encouraging me not to give up on problems I could not solve, hearts I could not mend. Lesson learned, right? Apparently not. I had nearly forgotten about my front-door saint when two of my college friends announced the birth of their second child, a daughter. 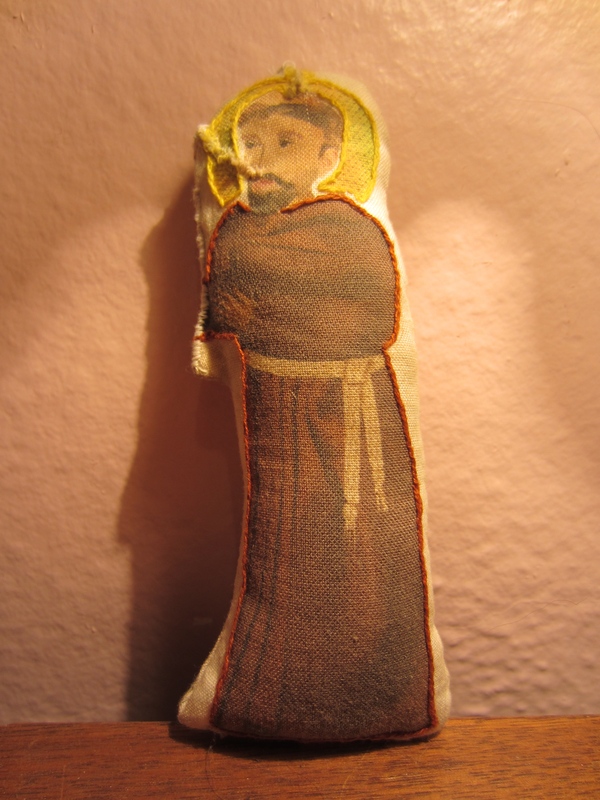 I found a beautifully illustrated version of St. Francis’ “Canticle of the Creatures,” and I decided to make a St. Francis softie to accompany the book. I loved the idea of a little girl growing up to cherish Francis’s reckless love for God’s kingdom and all its creatures. I bought the fabric from a friend’s Etsy shop, embellished the saint with some simple embroidery, and then stitched and stuffed him. Before I could send him off to his new home, however, my hound-dog decided he must be a gift for her. I came home to find bits of his stuffing all over the dining room floor. The saint himself was missing an arm and he boasted enormous gashes across his face and halo. Distraught, I posted a picture of the carnage and appealed for sympathy. What’s the point of making something, I pouted, if perfect is impossible? My friends, however, insisted that all was not lost. One of the most compelling comments came from the mother whose baby was to have the toy. “Scars and stretch marks tell a story,” she wrote “especially in the story of mothers and babies.” Several other friends pointed out that Francis himself, a patron to animals, would probably laugh to know that an exuberant hound had taken such joy at his expense. And so, I scrubbed the dirt away, threaded my needle with gold, and began to stitch the holes. Mending is tedious work, and to fix a jagged tear requires both precision and creativity. As I stitched, I remembered one of the first disagreements my fiancé and I had. We argued about the once-popular praise song that croons, “Brokenness, brokenness is what I long for….” I have hated that song since I was a teenager. I suspect it fools many people into praying a prayer they don’t actually mean. Even knowing that God can use sorrow, I don’t ever yearn for pain. I want to be whole, healed, strong, resurrected. And didn’t Christ, on the night he was betrayed, pray that the cup of sorrow might pass from him? Yes, and yet he also prayed, “Not my will, but yours, Father.” He didn’t accept pain for its own sake, but as the culmination of his purpose: to reveal God’s saving love to mankind. He was obedient even unto death, and when he rose from the grave, he still carried the scars of his crucifixion. Do the scars point to some limit on God’s mercy or power? Certainly not. God could have raised Christ with each and every cell made perfect. So why leave the marks? I won’t presume to know the deepest answer to that question, but I can point to at least one of the ways Christ used those wounds: in John 20:24-29, he holds them out to his grieving friend, Thomas. The flesh tells a story, helping Thomas to believe that Christ taught about the new life and the kingdom that is coming. And so, while I could have ordered a new Francis and scrapped the old one, I chose to mend. I chose to hope that the baby–who will, no doubt, gnaw on Francis with as much glee as my hound–will grow to love the humble and the broken of the world. That she would learn to treasure God’s saints not only in their glory, but also when they bear the scars of love. Perhaps I need to pray that prayer for myself. I share my house with two broken saints: one mended, one broken but with flowers in his hands. I am beginning to think that they are not only saints, but prophets. They teach me that our love for another fails daily, but also that, by the grace of God, we can sometimes help one another mend. They also teach me that some wounds are too deep for my hands to repair, but that we can bring flowers, time, casseroles until the wounded hands of Christ come and make all well. In a few months I will make my home with another Francis. This one isn’t broken, but he is weather-beaten. He watches over a parcel of land that is already precious to me. First, it will soon house a revolutionary ministry to the homeless. (It’s called the Community First! Village, and you can learn more about it here). It will also be the ground where my marriage begins. I am sure that when I take up this new chapter of my life, I will find myself overwhelmed by all that is broken in my own life, in my husband’s, and in the lives of men and women who have spent years on the streets. Surely, there will be days I want to escape. Already there are days I rail at God for not fixing everything and everyone at once. I still won’t sing “Brokennes is what I long for,” just as I still wish, deep down, that my dog hadn’t mauled St. Francis. However, I will pray and sing for God’s kingdom to come. If that means making my home among so many broken saints, then God give me grace to love them well. If that means being broken upon the altar, then Spirit give me the courage to be thankful for that suffering. Christ, teach me to fill their hands with flowers. Help us ask one another for the stories behind our scars. Use their broken hands to stitch my own wounds up with gold.